Today Felipe (my husband) and Tom (our friend visiting from the US) went to visit a drug dealer here in the slum. Let's call the drug dealer Micheal. Felipe got to know Micheal when he first moved to here to the Lighthouse and has watched Micheal literally grow up before his eyes. Micheal actually participated in one of the children's groups that Felipe led and he is the nephew of our cook here at the Lighthouse. Micheal is 16 years old - just a teenager - and is already working in the drug trade here in the slum of Cafezal. He has actually worked on and off with drug trafficking over the past few years. He does not go to school and has a sad family history. Just today Micheal even shared with Felipe that his little brother, who is just 11 years old, is already using drugs. This broke my heart to hear...A boy so young already using drugs. An 11 year old should be playing and enjoying his childhood, not using drugs. Unfortunately this a reality here in the slums. Micheal sells drugs from a small house in the middle of the slum. People know where to go to if they want to buy drugs. Felipe and Tom went to this house today, not to buy drugs but to talk with Micheal and see how he is doing. Felipe is planning to continue visiting Micheal on a consistant basis. He wants to reach out to him, spend time with him, pray for him and invest in Micheal's life. In the future Felipe will be writing more about his experiences with Micheal and sharing a bit more of Micheal's story here on our blog. Please pray for Micheal. 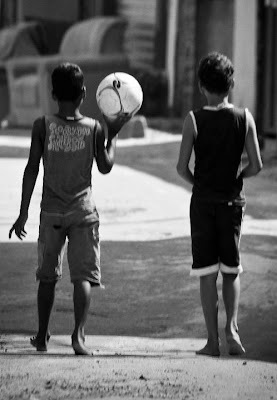 We have seen God do miracles in the lives of other drug traffickers here in the slum. There is hope for Micheal and there is a way out. Please pray that God would move on Micheal's heart and bring a change to his life!